The Faculty of Health Sciences at the University of Cape Town is addressing the shortage of clinician-scientists in South Africa by introducing two research training tracks in parallel with the professional MB ChB programme, namely the intercalated BSc (Med) Hons/MB ChB track and the integrated MB ChB/PhD track. The BSc (Med) Hons/MB ChB track is available to MB ChB students who have completed the first two years of study. The track comprises a course in Molecular Medicine given concurrently with the MB ChB third-year curriculum, followed by a BSc (Med) Hons as a 'year out' of MB ChB. Subsequently students may enrol into the integrated MB ChB/PhD track that enables them to undertake a PhD concurrently with MB ChB studies, which will be spread over additional years, or alternatively to undertake a PhD after completion of the MB ChB. These tracks, which were launched in 2011, represent an opportunity to train a new cadre of young African clinician-scientists at the undergraduate level. The high burden of disease in SA makes the revitalisation of clinical research even more urgent. Increased clinical research capacity is essential to the well-being of its growing population and to the development of the country as a whole. If clinical researchers are to be retained and research in health and environmental issues- is to increase, as proposed by the Department of Science and Technology's 'Ten Year Innovation Plan to transform the country into a knowledge-based economy', it is crucial for universities, private sector and government to unite in an effort to train a critical mass of researchers for the future. The Ministry of Health has responded positively to the recommendation of the National Health Research Committee to train 1 000 clinician PhDs through the National Health Scholars Programme over the next ten years. [7,10] This programme offers scholarships for PhD studies for a period of 1 - 4 years, and the current value of the scholarship is equivalent to the salaries of health professionals employed by the Department of Health. This major financial investment is aimed at addressing the paucity of clinician-scientists in SA. In addition, measures should be put in place to increase these numbers by introducing research training at both undergraduate and postgraduate levels, as recommended in the ASSAf report on clinical research and related training. The Faculty of Health Sciences at the University of Cape Town (UCT) has taken the initiative in addressing the critical shortage of clinician-scientists by introducing two clinical scientist research tracks that run in parallel with the professional MB ChB programme, namely the intercalated BSc (Med) Hons/MB ChB track and the integrated MB ChB/PhD track. These tracks are based on similar programmes offered in the UK and the USA. They have been found to be valuable in introducing future clinicians to research and in providing a cadre of highly trained physician-scientists who are likely to be attracted to and excel in careers in academic medicine. [11,12] Furthermore, the National Institutes of Health (NIH) in the USA offers a fully funded Medical Student Training Programme (MSTP), where students graduate with a MD/PhD. [13,14] It has been established that MD/PhD graduates are more likely than other medical school graduates to receive post-doctoral fellowships, to hold academic appointments, to receive external research funds and to apply for NIH grants, and they are also likely to have published more than their MD counterparts. The intercalated BSc (Med) Hons/MB ChB track at UCT is available to MB ChB students who have completed the first two years of the MB ChB programme. It is targeted at the most talented and motivated medical students, who occupy the top 5 - 10% of the class. This track starts with an additional one-year course in Molecular Medicine. The course is given concurrently with the MB ChB third-year curriculum (Fig. 1) and was specifically developed to provide medical students with theoretical and practical knowledge as well as basic biochemical and molecular laboratory techniques, with outcomes equivalent to a BSc major. This, together with biosciences MB ChB courses, meets HEQS-F (Higher Education Qualification Sub-Framework) level and credit prescription for admission to BSc (Med) Hons. Having passed the Molecular Medicine course and the third-year MB ChB, the students take a 'year out' from MB ChB and enrol in one of the laboratory-based BSc (Med) Hons degree programmes offered by the Faculty of Health Sciences. [151 The BSc (Med) Hons consists of course work and a research project, and is an excellent opportunity for medical students to obtain first-hand experience of laboratory-based research. While registered for the Honours programme, they register concurrently for a specially designed clinical course to ensure continuation of their clinical MB ChB training. The Honours year provides the medical student with deeper insight into the biological sciences that will benefit their medical studies and mould them into clinicians who can better integrate basic and clinical sciences. Furthermore, the intercalated Honours track prepares the students for laboratory-based MSc (Med) and PhD dissertations. On completion of the Honours programme, students are awarded the BSc (Med) Hons degree, and on returning to fourth-year MB ChB they may enrol into the integrated MB ChB/PhD track (Fig. 1). They can apply to register concurrently for an MSc (Med). Their registration may be upgraded- to PhD studies in the course of the MB ChB studies, and their MB ChB courses in years 4 - 6 may be spread over an additional year or years to enable them to undertake the MSc (Med) and/or PhD. On completion of the MB ChB, students will be able to complete their PhD and graduate. Alternatively, they may resume years 4 - 6 of the MB ChB and on completion embark on PhD studies that are expected to span three years. ChB was launched in 2011, with five MB ChB students undertaking the Molecular Medicine course during their third year (Fig. 1). Four continued with the BSc (Med) Hons programme in 2012 as a 'year out', while one decided to leave the intercalated research track and continued with year four of MB ChB. All four students completed Honours successfully. Two obtained a first-- class pass and were the best students in their programmes (one in Physiology and the other in Infectious Diseases and Immunology). The other two completed Medical Biochemistry Hons, and obtained upper second-class passes. In 2013, three of the four resumed medical studies and enrolled in year four of MB ChB, while the fourth student decided to undertake MSc (Med) studies. This high performance confirms that the Molecular Medicine course is effective in preparing medical students for the Honours programme. 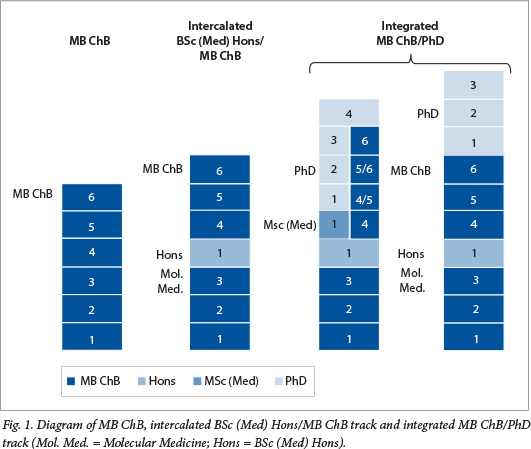 In 2012, five third-year MB ChB students were admitted to the intercalated track, completing the Molecular Medicine course and continuing with the BSc (Med) Hons in 2013 (see Table 1 for summary of student enrolment since the intercalated track was launched, including a breakdown by population group and gender). It is gratifying to observe that the research track is developing a new cadre of clinician-scientists who are drawn from the full spectrum of the SA population. One of the students, who is currently completing Honours and is returning to year four of MB ChB in 2014, will be enrolling into the integrated MB ChB/PhD track and has applied for concurrent registration to do MB ChB year four and MSc (Med). In 2013, nine third-year MB ChB students were admitted to the intercalated track and are currently undertaking the Molecular Medicine course. All have applied to continue with BSc (Med) Hons in 2014. In addition, 24 second-year MB ChB students have applied to undertake the intercalated Honours track in 2014. The intercalated track adds an extra year to the MB ChB programme and involves additional costs for the students. Tuition fees (2013 prices) for the Molecular Medicine course are R18 700, for the BSc (Med) Hons programme R37 260, and for the clinical course during the Honours year R2 900. In addition, there are living costs for the duration of the BSc (Med) Hons (about R60 000 in 2013). The additional costs for the research degrees should ideally be covered by scholarships in order to guarantee equitable access to research training. To date these costs have been met through an annual award from the UCT Vice-Chancellor's Strategic Award, an annual grant from the MRC, and a generous annual donation from Boehringer Ingelheim. These funds, however, are insufficient for all applicants, and the anticipated further expansion of these parallel research tracks will require additional funds. This proposal is in line with the MD/PhD programmes overseas where scholarships that cover the additional tuition fees and living costs for the additional study years are awarded. Furthermore, the NIH MSTP programme in the USA offers a fully funded MD/PhD programme. Scholarships for students admitted to the parallel research tracks at UCT are R120 000 per year in value, modest when compared with the fellowships offered for a qualified clinician to undertake PhD studies on a full-time basis (approximately R500 000 per year). Therefore, offering parallel research degree tracks for medical students may achieve the same outcome at a fraction of the cost of funding postgraduate clinicians. The most suitable time to undertake PhD studies is while a student is young and typically has no family responsibilities. These tracks provide clinicians-to-be with solid theoretical and practical basic sciences knowledge and skills, enabling them to undertake laboratory-based MSc and PhD dissertations. Furthermore, scientists (PhD) can supervise these PhD dissertations, and this can address the shortage of clinician-supervisors. These parallel research tracks (Fig. 1) extend the time to graduation for the MB ChB students. Internship and community service still await these graduates. We therefore propose that a PhD undertaken during medical studies, or immediately after completion of the MB ChB, be considered as community service. The initiative of offering parallel research degrees to MB ChB students, spearheaded by UCT, offers excellent MB ChB students the opportunity to do an Honours degree, and subsequently a PhD degree, in parallel with their medical studies. Parallel research degrees to medical students are a proven route to train and produce cadres of young clinician-scientists. The Ministry of Health together with the MRC have prioritised PhD training of clinicians. The support of these agencies is required for the implementation and expansion of these parallel tracks, which can form a sustainable conduit for training clinician-scientists to address the critical shortage of academic clinicians and revitalise medical research in SA. We invite other medical schools to collaborate with UCT in the development of a National Medical Student Research Training Track based on research degrees that are intercalated and integrated with the MB ChB degrees. We are grateful to the UCT Vice-Chancellor's Strategic Award, the Medical Research Council of South Africa, and Boehringer Ingelheim for funding the first three years of the intercalated BSc (Med) Hons/MB ChB track.